Modigliani portraits have become an art room staple, thanks in no small part to Kathy over at Art Project for Kids for providing a simple, fool-proof technique for imitating the elongated faces famous to Amedeo Modigliani. 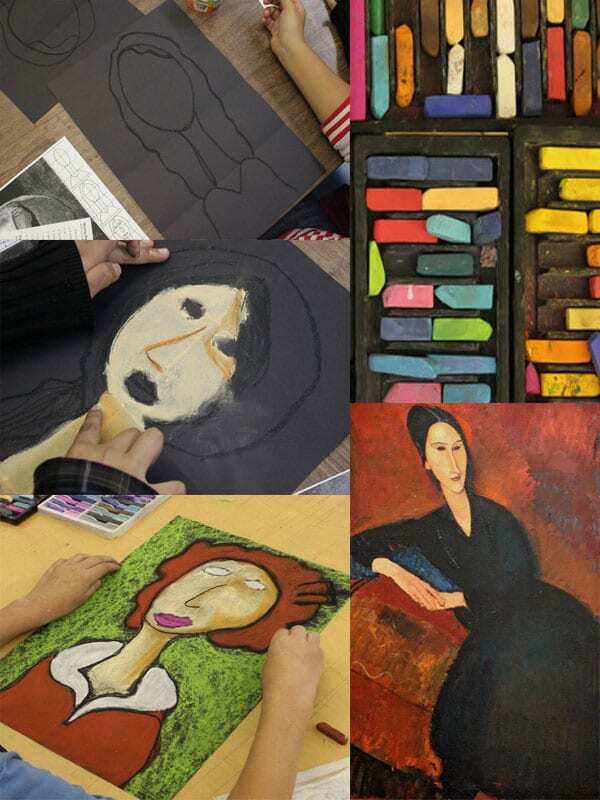 I copied Kathy’s project a couple of years ago with my sixth grade students where we created the Modigliani self-portraits in oil pastel. This year I wanted to try chalk pastel after seeing an expressive Modigliani Portrait on A Faithful Attempt blog. The students used charcoal to add deeply expressive lines which really adds to the piece. An Italian artsist working in Paris, Modigliani is famous for painting wonderful figures. I love his portraits of the women in his life and I wonder what he was thinking when he purposely omitted irises and pupils in his eyes. Instead, the faces are strangely mask-like. He drew his figures with the graceful lines of a fashion model, with gentle oval faces and elongated necks. The colors he used were mostly warm and earthy. Here is a link that gives more information on Amedeo Modigliani. Instead of Kathy’s technique of using a ruler and pencil to divide the paper, I took a short cut and folded the paper in half lengthwise, then crosswise. Two more crosswise folds from the top towards the middle crease and the bottom up towards the middle crease and a grid was formed. This is far easier and takes up a lot less time than pencil lines. Just be sure not to form deep creases; a light fold line is all you need. Using Kathy’s drawing aids, we drew the outline, colored in the face and neck, then the hair and finally the background and clothes. I pointed out the use of warm, soothing colors for the portraits but didn’t limit the kids if they wanted to choose a bright color. The same with the eyes. We talked about how Modigliani painted “mask-like” faces with almond-shaped, empty eyes but if that was too creepy, they could add irises and pupils. As a final detail, I encouraged the kids to outline their shapes with a black chalk pastel. I demonstrated some blending techniques which some children really got into while others were a bit timid. Either way, the portraits came out lovely. 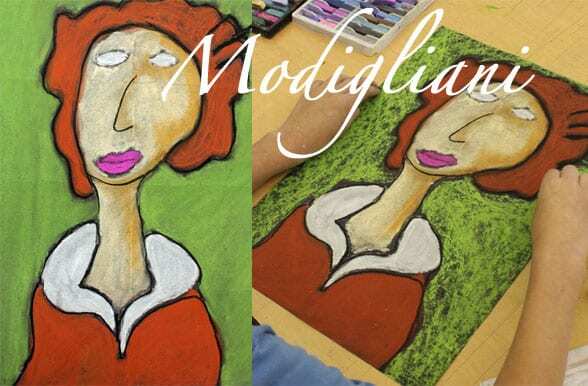 Have you tried this lesson of the Modigliani Portraits? Anyone use paint before? I’d love to hear if you used a different media other than oil pastel or chalk. Oh Wow, Patty! These look like they were done by accomplished, adult artists! Kudos to your students and you! I’ve never tried a Modigliani project but you’ve inspired me to give it a try. Thanks! Thanks for the mention, Patty! Your website has always been an inspiration to me! Your 6th Graders did a fantastic job with theses- I love the soft effect created by the chalk pastel. I tried this with oil pastels with my 8-12 year old homeschool class. They loved it. I will consider using dry pastels the next time. Thanks for the ideas!! I recently did this with my 5th graders. Drawn with black oil pastel on black paper. Face/neck/hair colored with oil pastel and the background was painted with one color of tempera to keep the smooth, bold look. I thought it was a very successful project. I’m interested in trying the chalk pastel version next time! Thanks for sharing. You’ll love the chalk…it looks so warm and lovely. Have fun! My daughter did this at the Art Center in our small town, she did it on Canvas 12 by 18 size and used acrylic paints, it is amazing and her head is tilted with a background. Acrylics are my favorite and I can imagine how beautiful her portrait must have looked. Your students did an amazing job! Did you spray them when they were finished? I can’t wait to try this! I taught this lesson to my 6-8th graders. Their pictures were so creative and turned out beautifully! With what do you spray them? I tried two coats of acrylic spray which actually darkened the colors. I was hoping they would lighten back up when dry, but, unfortunately, did not. Any suggestions? Thanks so much. Spraying tends to distort the pastels so I don’t bother. I find there is no difference between cheap hairspray and expensive fixative. Place the artwork between newspaper. Should keep until parents decide what to do with the art. We did this lesson with a second grade class and it was fantastic! I had the paper folded prior to the lesson to save some time. We walked the kids through step by step and saw their artwork come alive. The kids loved seeing the others work when it was done and got a kick out of figuring out who was who. We did them in chalk pastels, is there anything more we need to do to finish them? I saw that some use hairspray to set. Is it necessary? I generally don’t use a fixative on chalk pieces. It takes too long to apply and it just seems like an added step. Hairspray is a great fixative when you must use one. Problem though, is that it creates tiny spots on the artwork. So does the expensive fixatives. These were awesome! Simple plan and the results were brilliant, even from thoses students that usually struggle. Have rave reviews and request for your plan. Patty’s blog has inspired me to post a couple of Modigliani inspired 8th grade self portraits my students did. I had not seen Patty’s lesson, but love Modigliani’s style. His inspiration was very successful! The students released to go beyond exactly what they see and “stretch” their own style a bit. We worked very large, 24×36/oil pastel. I posted 3 examples on Pinterest….which is stretching my abilities a bit! I love this project as well. Would love to see your student’s work. Perhaps you can add your URL to a facebook post? LOVE these portraits. The warmth of the colors is beautiful. The sectioning of the paper is a brilliant idea to get the elongated proportions just right… I will defintley do this this school year with my 4th or 5th graders. Maybe both! Question – I do not see any Mod. portraits of boys. Did the boys draw girls or are boy portraits just not posted? THANKS! Because Modigliani painted mostly women, we stuck to portraits of women. I gave the students a choice to do a self-portrait or not. Sometimes, when teaching portrait drawing, it’s much easier for the student to draw a face that is not their own. Really frees them up! Hi There..we just created these portraits and they are amazing..Thanks so much for your wonderful blog..I credited you and your blog in my post..!! I can’t believe it took me a year to realize you posted such nice comments about me! Thanks so much! I love the results you are getting too, those drawings are amazing. Basically, I think the project idea works because the kids don’t get hung up on making their face look “right”. Distorting it frees them up. Whatever works, I say. Thanks again! They look amazing, Emily! Thanks for sharing. Do you find black paper is what you use most with your chalk pastels? Also, what kind of chalk pastels do you use that have such vibrant colours? Thanks! I use black paper when I want to make a statement with oil pastels. The black really makes the chalk pop. However, I mostly use chalk on white paper in mixed-media techniques (combination with tempera, marker, etc). I bought a set of Sax classroom pack chalk about 4 years ago and they were cheap and fabulous. I recently bought a more expensive chalk last year and they were terrible. I’ll see if I can find the link to the good stuff! 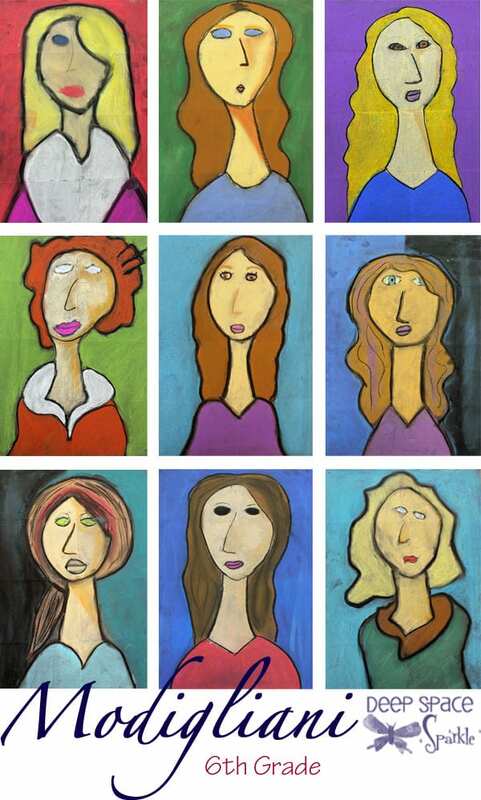 I love these Modigliani style portraits, thanks for sharing. Did you have the students draw the initial outline in black chalk pastel before adding the color? I was thinking that it might bleed into the light colors.